Campagnolo is soon going to be opening the Campagnolo Webstore, a new section of the official website. The first product to be featured is the sale of the famous Campagnolo BIG corkscrew, a product designed 60 years ago by the founder Tullio Campagnolo and still an iconic symbol of the Made in Italy. Aside from the quick release skewer, the Campagnolo Cavatappi (Corkscrew) is quite possibly the Campagnolo product that has lasted the longest without any need for improvements to its original design. A testament to just how functional, precise and groundbreaking this piece was and continues to be, the Campagnolo Cavatappi is identical in almost every way to its original version. The Campagnolo company takes pride in producing the most innovative and performance oriented cycling components available the world over. For over 80 years the company has produced elegant and extremely functional components and wheels that have won the most prestigious races at the highest level. The name of the company comes from Tullio Campagnolo whose passion for cycling was only superseded by his desire to innovate unique and functional products to improve the cycling experience. From the very first quick release to the cycling transmission, Tullio Campagnolo was able to invent and improve upon products that would forever change the world of cycling. Producing cycling components, transmissions and wheels that were considered to be not only functionally marvelous but were regarded as works of art, often times being compared to the intricate beauty put forth by the best timepieces. However, his clinical mind and desire to find mechanical solutions to common problems led him to innovate in other areas outside of cycling. Just as cycling is deeply imbedded into the Italian culture, so is the production (and consumption) of wine. Tullio on several occasions noticed the less than efficient manner in which wine bottle openers would remove corks, often times breaking them or leaving residue. the last straw came about while Tullio was entertaining a group of important friends. With a bottle of some of the finest wine in his collection in hand, he proceeded to open only to find that the dated cork left a great deal of residue inside the bottle… making a poor impression out of a gesture meant to make a positive one. Surely there was a mechanical solution to this problem and with the same clinical analysis and inventor’s spirit, Tullio set out to produce what did not exist; the perfect “Cavatappi” . While he wasn’t seeking to win the Tour de France or give Eddy Merkcx a technological advantage over his adversaries, Tullio held his Cavatappi design to the same scrutiny and standards as any other Campagnolo product destined for the racing steeds of the world’s best athletes. So true was his desire to produce a solution worthy of the Campagnolo name that not only were countless hours spent designing and developing prototypes, but parts from the most prestigious cycling products of the time were incorporated into its final design. While it wasn’t to change the world of cycling, it did change the way wine was opened in northern Italy… and beyond. A trip to the area surrounding Vicenza serves as proof to not only how popular the Cavatappi has become but also to its solid and flawless construction. One need only enter into any restaurant or trattoria to find a Campagnolo Cavatappi from more than 30 years ago still performing its task as elegantly and perfectly as when it opened its first bottle. 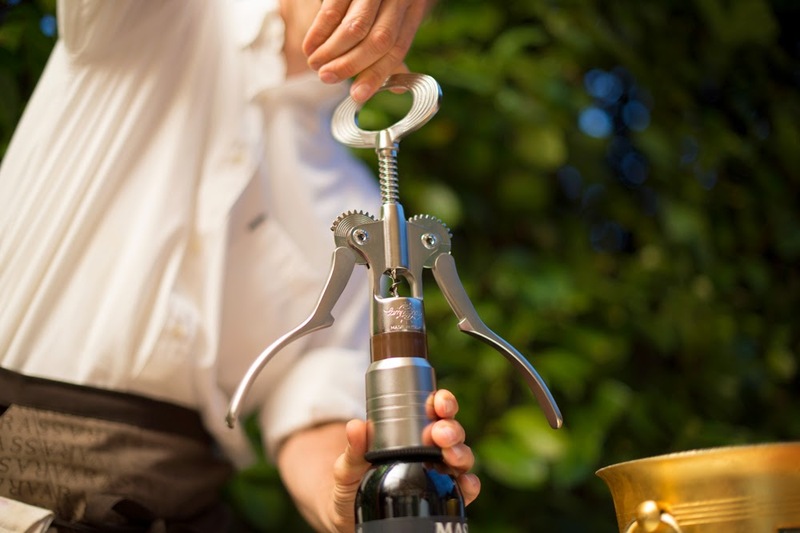 In part its diffusion is certainly due to the famous name Campagnolo but more importantly, the cavatappi became omnipresent in the Veneto region because of its own personal fame for being the most functional and long-lasting wine opener ever seen. The Cavatappi is not simply a fine product that happens to come from the Campagnolo factory. It has earned its name. The materials were painstakingly selected and meticulously crafted into a fine tool that, just like its cycling componentry counterparts, is both functionally perfect and elegant. It passes through the same quality controls and is held to the exact standards as every Campagnolo product, meant to wear in as opposed to wear out. Even at first glance the particular nature of this fine tool is apparent. It’s extremely large size was intentionally incorporated into its design to ensure that flawless cork removal was guaranteed no matter the size or shape of any bottle. To aid in this respect a telescopic “bell” was added to ensure that the cavatappi was “intelligent” enough to conform to any bottle and compensate for any need for more grip during the pulling phase of its movement. The beautiful wings, in addition to giving a somewhat angelic appearance when opened, allow for a completely symmetric movement that concentrates its pulling force directly above the cork. These features all centered around a painstakingly crafted corkscrew come together to remove perfectly even the oldest corks from the most prized bottles of wine. There is also a rare "Record" version (see here). And, for Campagnolo's 75th anniversary there were numbered Cavatappi made (see here). We look forward to using ours for many, many years!